We have quite a lot to be thankful for this year. With the opening of our very own Tea Bar and the launch of tea flights guided by our own tea geeks, we've been able to meet so many more new Tea People. That's allowed us to be able to launch some pretty cool collaborations, like our newest tea mugs with Shawn Kam, of LUV HAUS Ceramics. It's also opened the doors for more wholesale accounts; cheers to now being able to drink Tea People out on the streets, at places like Alfred Tea Room in LA and Ken Ken Ramen in San Francisco! We couldn't have had such a great year without you. Trust us, you're the reason we're able to continue to embark on experiments (nitro, cocktails, new blends) and collaborations, expanding the definition of the tea world. That's why, as a big holiday thank you, we put together this simple Holiday Gift Guide, to make shopping for friends, future tea lovers, relatives, or even yourself, that much easier. Plus, everything is 15% OFF for the rest of the holidays. Thanks for making Tea People a part of your #steeplife. Happy holidays, happy shopping, happy sipping. We're all about collaborations. Our most recent one was with Shawn Kam of LUV HAUS Ceramics in Berkeley, CA. Made by hand for you hand; these cups were built with the tea drinker in mind. These Tea People x LUV HAUS mugs have a lipped rim for extra comfort and care when drinking. Not to mention, LUV HAUS handcrafted these beauties to withstand the hottest of steeps, dishwashers, and microwaves! We put together three batches of these soda fired cups, each completely organic and unique in color and feel, making them the perfect gift for that special tea enthusiast or ceramic lover in your life. At our tea bar, we're known for our tea flights: three samples of curated teas paired perfectly with locally produced chocolate. Each flight is its own journey for your tastebuds, following a certain theme, or origin of flavor. For the holidays, what better way to share some sips than brewing your own tea flight for a friend, relative, or house guest? Here are our three favorite tea flights, broken down for you to steep and serve on your very own! See which tea journey sounds best to take your tastebuds on. Happy sipping! This flight is all about surprise flavors. You can never judge a tea by its tea leaf and these teas are here to prove that point. Each has a unique mouthfeel and flavor that will, to simply put it, shock and awe your tastebuds. From burnt peach flavors, to eucalyptus and grape, ending with the surprisingly milky taste of the 100% dairy free Milk Oolong. This flight will give your palate a run for it's money, surprising it with each sip. No, these aren't just three teas from China! These are three teas that made it to the actual list of the Top 10 Teas in China. That means, they're they've earned their spot at the table for being the best of the best loose leafs. Starting with the classic Dragonwell, nutty and crisp in flavor, and ending with Black Coil, or what we here at Tea People like to call, "The Hell's Angeles" of black teas. All of these, straight from the Mother Country, can attest for themselves, but we suggest you let your tastebuds do the ranking. Tisanses, herbal teas, caffeine-free blends; this tea flight is all about expanding the definition of what tea can be. Each are hand-blended in San Francisco, CA and produce bright and vibrant colors with each steep. Naturally sweet, earthy, and bold in flavor, all of these are 100% caffeine free, making it the perfect late night flight for the herbal lovers in your life. 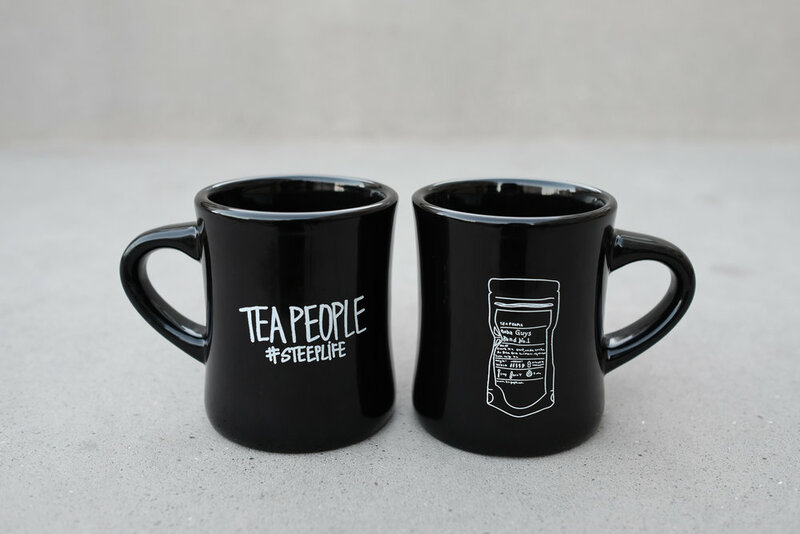 Our first ever Tea People mugs are here just in time for the holidays. In jet black, these throw back diner mugs are the perfect thing to hold all of your steeps in. Emblazoned with hand drawn images, these bad boys beg to be filled to the brim, are built to last, and play well the hottest of liquids, microwaves, and dishwashers. *Add a bag of Boba Guys Blend No. 1 to go with a Diner mug for the perfect simple holiday gift. Easy gift giving for just $20. It's been a big year for us in wholesale. Did you know that Tea People loose leaf and brew pots can be found beyond the tea bar and our store online? We have been making our way into tea drinker's steep lives via coffee shops and tea rooms across the country. The most recent and notable one being, Alfred Tea Room. Alfred Tea is a pretty, all pink tea room in West Hollywood and is the ultimate place to enjoy a brew like Milk Oolong, when you're away from home or the Bay. Other places that carry Tea People Blends: Good Eggs, Ken Ken Ramen, Black Sands Brewery, Chapel Hill Coffee, Bespoke Post, and LMHQ. The Tea Bar, our home sweet home. Come visit us during the holidays to buy all your favorite loose leaves, share the holiday spirit over a tea flight with a friend, or sit back and enjoy a personal brew pot to escape from the cold with. During the holidays, let us make the Tea Bar your home away from home. We're at 8 Octavia St #308 in San Francisco.